This is the fifth in a series of spotlights on our spring 2017 student interns. Learning Life’s students this spring are translating documents, conducting research, fundraising, doing outreach locally and internationally for our Citizen Diplomacy Initiative (CDI), and other work. Jo Moley, interviewed below, is helping with fundraising, outreach to Salvadoran organizations, and social media communications and strategy, among other things. I was born in Alexandria, Virginia and raised in Darien, Connecticut. I am a junior in the Georgetown University School of Foreign Service majoring in Regional Studies of Latin America and minoring in Spanish. In my free time, I enjoy reading, working out, and watching/listening to Spanish movies and music. I also really enjoy knitting! I learned how to knit when I was working at an elderly care facility in the Córdoba region of Argentina last summer, and it’s surprisingly relaxing. 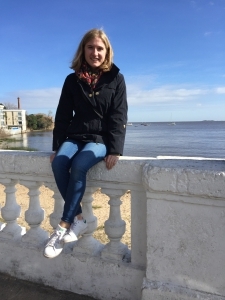 The life experience that I have had that has particularly shaped me thus far was a three-day solo trip that I took during my time abroad in Argentina. While I speak Spanish at an advanced level, I am by no means fluent. Even if I were fluent in Spanish, my sense of direction is so terrible that a solo trip would be a challenge regardless of the lack of a language barrier. Despite, these obstacles, I decided to plan a three-day trip to four different towns/cities in Córdoba during a weekend off from work. First I went to the largest city in the region, Córdoba, then I traveled to Alta Gracia, a small town where Che Guevara lived as a child, and finally I took a bus up into the Andes Mountains to visit two European-style villages nestled in the mountains. I traveled by bus and stayed in hostels, planning activities and figuring out the next leg of my journey on the fly. As someone with limited travel experience, this was challenging but extremely rewarding. I was proud of my language abilities and my capacity to find my way from place to place. I also found the experience of traveling solo to be extremely liberating. I was able to plan my days based completely on my own interests, and it felt as though time passed in a different manner when I did not have to work within the constraints of other peoples’ schedules. I listened to and observed the people and places that surrounded me, which I think allowed me to experience things at a higher level. This trip increased my confidence as a traveler and an individual. I had no choice but to rely on my own skills in a completely foreign region in a country to which I was not a native, which was empowering and exciting. I further developed my love for traveling, and I realized how much I am capable of handling. I do not currently have specific career plans, but I am very interested in conflict resolution, and I am considering pursuing a graduate degree and/or working in that field. I am writing my senior thesis on the politics of memory in Argentina, and the preliminary research for this project has allowed me to explore theories of transitional justice and conflict resolution as they apply to Latin America. After college, I would love to work abroad in Latin America or within the Latin American policy community in Washington, DC. I chose to intern with Learning Life because I genuinely support the Citizen Diplomacy Initiative‘s goals to diversify the voices in foreign affairs and to encourage the growth of global citizens. Additionally, I was excited by the opportunity to become more familiar with Washington, DC and its residents through Learning Life. As a Georgetown student, I found that I rarely left my neighborhood, but Learning Life has given me the opportunity to work in Wards 7 & 8 in DC. Because of my major, I spend most of my time studying foreign countries and trying to understand the culture of groups of people thousands of miles away. Working for Learning Life has shown me that the first step to become a global citizen can be to better understand your own community. The most beautiful place that I have seen on earth is Lake Winnepesaukee in Wolfeboro, New Hampshire. I think that I find it so amazing because I spent summers there when I was a child, and my grandparents live in Wolfeboro. Even without the nostalgia factor, Lake Winnepesaukee is an extremely special place. It is very large, so it is possible to drive a boat into the middle of the lake and just be surrounded by water and pine trees. Because of these pine trees, the air always has a distinctive, fresh smell that I strongly associate with summer. In the early evening, the sun filters through the trees as it sets and everything appears golden as the sky turns pink, orange, and red. Everything about the lake is peaceful and beautiful.